Hurray for me. Today is my birthday. 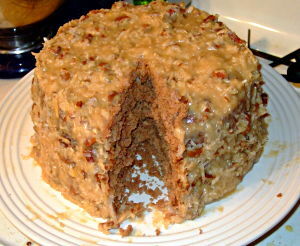 Last night, I decided to make a German Chocolate Cake. Amy thought I shouldn’t have to make my own cake, but I wanted to try one from scratch. The cake used real melted chocolate and I folded in whipped egg whites. The frosting was pretty standard fare with egg yolks, evaporated milk, sugar, etc. I didn’t have a piece until tonight. I cooked the cake a little too much and it was slightly dry.